The subject and verb are the most important elements of a sentence. The relation between the subject and the verb depends on two issues: person and number. The verb of a sentence must be in agreement with the subject in regard to person and number. The number of subjects can be singular and plural. The verb must be singular if the subject is singular and the verb must be plural if the subject is plural. So, identifying the number of the subject is required to take a verb. The person of the subject can be first, second, and third. The verb changes according to the number and person of the subject. Singular subjects need singular verbs, while plural subjects require plural verbs. ‘Be’ verbs change the most according to the number and person of the subject. Other verbs do not change much on the basis of the subjects except the verbs of the simple present tense. If the subjects are a third person singular number, the verbs are used with s/es when they are in simple present tense. The verbs with s/es in the sentence are called singular verbs. ‘Be’ verbs according to the number and person of the subject. First I am an excellent tennis player. We are excellent tennis players. Second You are a nice person. You all are nice people. Third Alex plays well under pressure. He is a good player. They are good at chasing. They play well under pressure. When the prepositional phrases separate the subjects from the verbs, they have no effect on the verbs. A study (singular subject) on African countries shows (singular verb) that 80% of the people (plural subject) of this continent live (plural verb) below the poverty line. The perspective of different people varies from time to time. The fear of terrorists and militants has made them flee the city. Nouns connected by the conjunction and in the subject work as the plural subject and take a plural verb. Alex and Murphy are coming here. Robin and his friends want to go on a tour. Apples and mangoes are my favorite fruits. If the conjunction ‘and’ is replaced by together with/ along with/ accompanied by/ as well as, the verb will have no effect for the later part of these expressions. The words prior to these expressions are the subjects. Alex, as well as his parents, is coming to the party. The boys, accompanied by their teacher Mr. Robbins are planning a tour. Note: If these expressions are replaced by ‘and’, the subjects will be regarded as plurals, and so the verbs have to be plural. Example: Tom and his brothers are going to the city. Some nouns are always singular and indefinite. When these nouns become the subjects, they always take singular verbs. *Note: Either and neither are singular if they are not used with or and nor. Everybody wants to live happily. No human being lives in that house. Neither of you is responsible enough to handle it. Each student has to submit a separate assignment. Some nouns are always plural. These nouns have two parts. Scissors, shorts, eyeglasses, pants, thongs, jeans, trousers, etc. My pants are in the drawer. Note: If these words are preceded by the phrase a pair of, they will be regarded as singular subjects. A pair of pants is needed. This pair of trousers is ugly. None is a singular subject when it is used alone. When it is used with a prepositional phrase starting with of, the subject can be both plural and singular. None of the money has been used. None of the teacher wants failure for students. None of the students want to fail. Note: No + plural noun takes plural verbs. Example: no men are hungry now. Either . . . or, neither . . . nor, or, and nor take two nouns before and after them. The nouns placed after these conjunctions are regarded as the subjects of the sentence. The nouns placed prior to the words or and nor have no effect on the verbs. Neither Alex nor his brothers are going to the party. I or Robert opens the door when someone comes. Neither the boys nor we are responsible for it. The sentences beginning with here/there are different in structure. In this case, the subject comes after the verb. Here/There + verb + subject . . . . . . There is a pond near the house. There are some candies on the table. Here is the document for your car. Collective nouns are usually regarded as singular subjects. The committee has decided to postpone the game. The family was ecstatic by the news. The crowd enjoys the excitement in the game. Note: The following phrases are also regarded as collective nouns and thus singular subjects. A flock of sheep always moves together. A pack of wolves is approaching towards the herd of cattle. A school of fish always hides from the big fishes. A number of + noun is a plural subject, and it takes a plural verb. The number of + noun is a singular subject, and it takes a singular verb. A number of people prefer cricket to football. If a gerund or an infinitive comes as a subject, the verb will always be singular. Walking is a good habit. Eating healthy food makes you healthy. If the + an adjective appears as the subject of a sentence, it will be plural. The pious are loved by God. The industrious are always not successful. The best do not lack integrity. 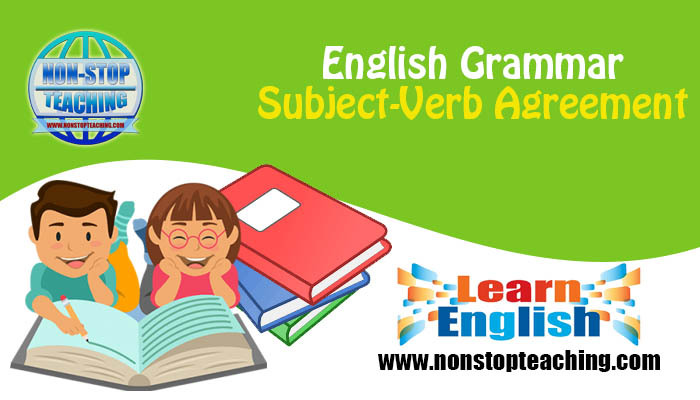 The subject and verb are the most important elements of a sentence. The relation between the subject and the verb depends on two issues: person and number. The verb of a sentence must be in agreement with the subject in regard to person and number. The number of subjects can be singular and plural. The verb must be singular if the subject is singular and the verb must be plural if the subject is plural. So, identifying the number of the subject is required to take a verb. The person of the subject can be first, second, and third. The verb changes according to the number and person of the subject.